For other uses, see Osasco (disambiguation). Osasco (Portuguese pronunciation: [oˈzasku]) is a municipality in São Paulo State, Brazil, located in the Greater São Paulo and ranking 5th in population among São Paulo municipalities. According to the IBGE 2015, Osasco currently has the 9th highest Gross Domestic Product in Brazil, and the 2nd largest in the State of São Paulo. The population is 696,382 (2016 est.) in an area of 64.95 km². It is among the world's more dense cities, similar in density to Tokyo and New York City. It's considered the major urban centre of the Western portion of the Greater São Paulo. 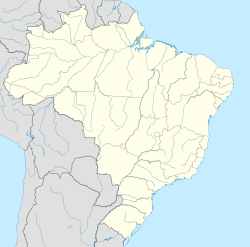 It used to be a district of São Paulo City until February 19, 1962, when Osasco became a municipality of its own. The city motto is "Urbs labor", Latin phrase that means "City work". The region that is now Osasco was inhabited by indigenous Tupi-Guaraní people. Bandeirantes lived in the region that is now Osasco, then called "Vila de Quitaúna". The famous "bandeirante" António Raposo Tavares lived there. Osasco was founded, in the 19th century, by the Italian immigrant Antônio Giuseppe Agù [pt] (currently the name of one of the main streets in Osasco). He came from the commune Osasco in the province of Turin.To Help of the Baron Dimitri Sensaud de Lavaud. Osasco is said to be the place of the first heavier-than-air flight in Latin America. Immigrants from Italy, Spain, Portugal, Germany, Ireland, Armenia (Trade), Lebanon (Trade), Israel (Trade) and Japan (Rural) came to Osasco in the period. Osasco became autonomous from the city of São Paulo on February 19, 1962. Explosion of the Osasco Plaza Shopping (1996). Osasco went prime city make Circuito Running for Nature, racing and walk (SportsFuse). Is an average elevation of 792 meters and 65 km² of area. Its boundaries are São Paulo to the north, east and south, Cotia to the southwest, Carapicuíba and Barueri to the west and Santana de Parnaíba to the northwest. As in almost all the metropolitan area of São Paulo, the climate is subtropical, specifically humid subtropical. The average annual temperature is around 18 °C, being the month of July the coldest (average 12 °C) and warmest February (average 30 °C). The annual rainfall is around 1400 mm. Osasco ranks 5th among São Paulo municipalities by population, with 666,740 residents as of 2010. The city also plays an important role in the state's industry, education and media, hosting prominent schools, universities and TV stations. Osasco due to its proximity to São Paulo, has a transit similar to the state capital, that is one of the more you carry the world. In the city can be found means of road and rail. Arco de Osasco, the city's landmark, in Christmas. It is linked by CPTM rapid transit to São Paulo by the 8 and 9  train lines. The Congonhas-São Paulo Airport (IATA: CGH) for domestic and regional flights. Another airport, the Campo de Marte Airport, serves light aircraft and helicopters. SANAZAR, Hirant. Osasco – Sua história, sua gente: Osasco, ed. do author, 2003. METROVICHE, Eduardo (org.). Osasco – Um século de fotografia: Osasco, Maxprint Editora, 2007. ^ "IBGE - Instituto Brasileiro de Geografia e Estat韘tica". ^ "::: Câmara Municipal de Osasco ::: Estado de São Paulo". www.camaraosasco.sp.gov.br. Retrieved 2016-11-20. ^ "INMET – Climatologia – Gráficos Climatológicos". Archived from the original on 2010-02-09. ^ "CPTM lines". CPTM (Companhia Paulista de Trens Metropolitanos). Retrieved 2008-12-12. ^ "FITO BR - Em Construção". ^ "International Exchange". List of Affiliation Partners within Prefectures. Council of Local Authorities for International Relations (CLAIR). Archived from the original on 5 February 2016. Retrieved 21 November 2015. This page was last edited on 27 December 2018, at 16:38 (UTC).